Released: November 22, 2013. Directed by: Francis Lawrence. Starring: Jennifer Lawrence, Josh Hutcherson, Liam Hemsworth. Runtime: 146 min. It’s impressive when big blockbuster sequels can improve over their predecessor in significant ways. What’s even more impressive is that the writers manage to make a great adaptation of a decent book. 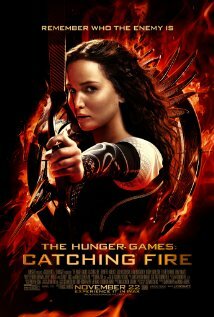 The film opens up with Katniss Everdeen (Jennifer Lawrence) hunting, something that used to give her more solace than it does now. When she hunts and kills a turkey, she gets flashbacks to killing Marvel in the Hunger Games arena; which is something that creatively compelled me right away. One can tell from her eyes that she is saddened, and is suffering from guilt. President Snow (Donald Sutherland) meets with the young victor to try to prevent an uprising within the Districts of Panem. Katniss has convinced most of the people of the Districts of the love shared between her and Peeta (Josh Hutcherson), but she hasn’t convinced Snow. As seen in the film’s trailers, the 75th annual Hunger Games is a Quarter Quell to remind a new generation of those who fell within the Rebellion seventy-five years ago. This time, President Snow is also using it as a way to remind the people of Panem that no one is invincible – and to that, the names for the Reaping will be drawn from the existing pool of victors; thus saying, Katniss and Peeta or Haymitch will have to fight in the games once again, this time against trained killers. There are many new characters introduced, but I’ll only discuss a few. Plutarch Heavensbee (Phillip Seymour Hoffman), is the gamemaker that replaces Senecca Crane (Wes Bentley) – and he’s far more interesting. There only a few tributes remembering, and they are the District 3 tribute Beetee (Jeffrey Wright), a technology wizard; Wiress (Amanda Plummer) of District 3; Finnick Odair (Sam Claflin of “Snow White and the Huntsman“) of District 4; Mags (Lynn Cohen) of District 4; and the tough-as-nails Johanna Mason (Jena Malone) of District 7. The returning characters are basically everyone who didn’t get killed off in the 74th Hunger Games. I’ll just move onto the performances because you already know the characters’ names. Jennifer Lawrence is excellent as Katniss, giving an even stronger performance than the first time around. This is because the character now realizes that she won’t have any privacy; and she doesn’t yet know what to do – love Peeta, which all people in the Capitol expect, or love Gale (Liam Hemsworth), her hunting buddy. I wish she could just play a game of Eenie-Meenie Miney-Mo, but it’s not that easy. The character is now suffering from post-traumatic stress, it seems to me, because she had to kill many people to survive in that arena last year. It is never really clear if she’s in love with Peeta or not, because she claims it’s just for the camera – but sometimes it seems real; so what the hell does her heart want? Lawrence is great at displaying all of her complicated emotions as the cheeky Everdeen. She is a great character, regardless, and she’s a real fighter – especially for those she loves. She’s always emotionally touching. Josh Hutcherson is strong as Peeta, because he’s hurt because he realizes Katniss’ love for him was just for the cameras – but like I said, it’s kind-of in between the two of being real and fake at times. Woody Harrelson is very funny as Haymitch and great at being serious. Sam Claflin is likeable as Finnick Odair, and he acts decently throughout. Lynn Cohen’s role of Mags isn’t a talking one, and I can’t recall if she was a mute in the novel; but she is a real sweetheart. Stanley Tucci is still awesome and eccentric as Caesar Flickerman, the eccentric talk-show host of everyone’s dreams. The plot is strong because it has spectacular pacing for a 146-minute feature. Much like the first film, the Games themselves are only a part of this story. The concept of this dysoptian future fascinates me; and I like how it marries this futuristic culture with the bread en circuses of Ancient Roman culture. This is where the government gives food and entertainment to the people to keep them happy, so they won’t revolt against the government. In this case, the government is the Capitol, they give enough food to the people to keep the districts from starving, and the actual people of the Capitol have so much food, they drink an elixir that makes them throw up so they can stuff more in. The entertainment is of course, the Games. Suzanne Collins, the book’s author, must be fascinated with Ancient cultures – since she borrows that from Rome, and since a main tribute (Finnick) has a trident, used by the Greek god Poseidon. I like the world Collins has created a lot because it’s hauntingly like our own in some ways; at least the entertainment way. These people actually watch a legitimate fight to the death, which would be morally wrong in this time to have that, but for cinema, it’s a great premise. I love movies like this (“The Condemned” is a guilty pleasure of mine), but this one is definitely not all about the killing. Half the time, the kills happen so fast that it’s to tell exactly who dies. Perhaps many of the tributes’ names aren’t revealed to us, because they just don’t have any identity that way – and they’re not that critical to the story in a few ways, so we won’t really care too much that they die. But when the villains die, I’d just like to see a bit more of the violence. I like the iminent threats of the arena in this film, because they’re creative and happen at inconvenient times. It seems that there are more natural threats created by the gamemakers this time around than the previous film; and it keeps the action exciting. This story’s also strong because the film can just focus on the government politics of the potential uprising and trying to stop it by using fear and constant floggings to destroy the people’s spirit; and it can also focus on the Games. The glamour of the Capitol people isn’t so in our face this time, but that’s because we were introduced to it in the first – and by now it just seems normal. The make-up and costume design is even better, especially a jaw-dropping piece for Katniss “created” by Cinna (Lenny Kravitz). One thing that is way better is the cinematography because the new director, Francis Lawrence (no relation to Jennifer), doesn’t feel the need to move the camera around when people are just simply talking. Gary Ross did that, even when no action was occuring – and he did it a lot more when action was happening. No shaky cam makes me a happy camper, and I am sure it will please others, too. There isn’t a lot of this film I don’t like, even if there are certain aspects it can improve on – but it has to appeal to the target audience. It’s still an immensely enjoyable movie and one of the year’s strongest films. I’ve seen this twice already, and that’s a rare occurence for me. (It’s great in both IMAX and 2D.) One more thing: The scenery is simply stunning. Reading the book is one thing, but to see this all come to life through its creative settings and beautiful landscapes, is just another whole spectacular feeling.